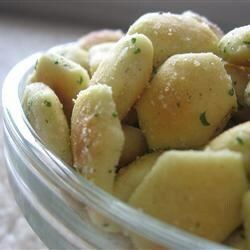 These seasoned oyster crackers make an easy topping for soup or for snacking. In a large bowl, combine the dressing mix, dill weed, vegetable oil, lemon pepper, and garlic powder. Add oyster crackers, and toss to coat. Spread evenly on a baking sheet. Bake for 15 to 20 minutes in the preheated oven, stirring gently after 10 minutes. Remove from oven, and allow to cool before serving.